BRAND NEW OPPORTUNITY.....Master Country Broker Licenses - Only 1 per Country! Why are we Launching Master Country Broker Licenses? The Master Country Licensee will be motivated to work closely with ANY Gold, Silver or Bronze Brokers because the Master Country Licensee gets paid for ANY successful deals in their license country.Therefore the more deals they help other Gold, Silver or Bronze Brokers to complete, the more the Master Country Licensee gets paid themselves! Different countries speak different languages, by appointing a Master Country Licensee that speaks the local language will make explaining and closing client transactions much easier and more effective. Over time Master Country Licensees will accumulate significant knowledge of the industry, Secure Platform Funding's services and local clients needs. This expertise combined with their regional country knowledge will provide a powerful resource that will result in improved advice to clients and higher deal flow for brokers. Lastly, To have a central point facilitating and coordinating regional transactions that occur within a country will have a number of significant benefits to all parties. 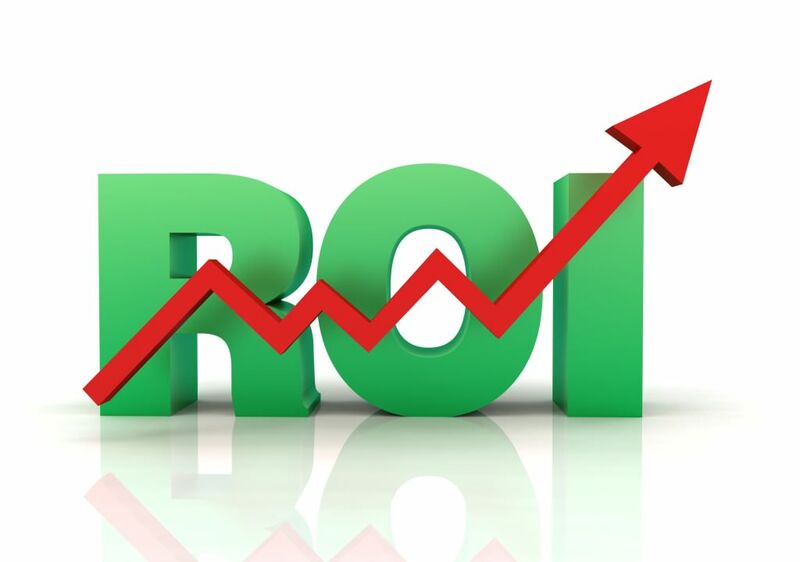 We see the implementation of Master Country Broker Licenses as a very positive step forward which creates a quality platform for greater growth of Secure Platform Funding and improved service to our clients and valued Gold, Silver or Bronze Brokers. Additional Bonus Income up to 2.5%: If a Master Country Licensee is also registered as a Gold Broker, then (on their own deals that they originate) they will be paid 1.5% for being a Gold Broker and 1% for being the Master Country Licensee, giving them a total return of 2.5% for each of their own deals. A Very healthy return! The "Secure Platform Funding Master Broker Logo"
The phrase "Secure Platform Funding Certified Country Master Broker" recognizing your elite status as the only Master Broker for that Country, and being approved to use this phrase on your website, stationary, business cards and email. 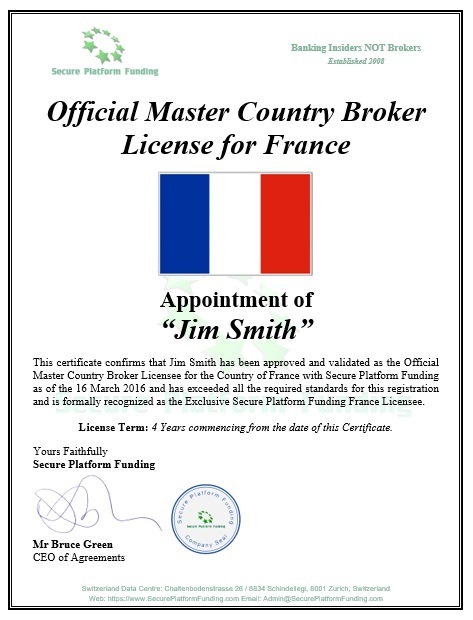 Special Master Country Broker Profile Page on the www.SecurePlatformFunding.com website. This Special Master Broker Country Profile Page will prominently feature your Business, a Personal Professional Photo of you, your Biography and your Full Contact Details. Certified Master Country Broker Certificate to display in your office and on your web site. 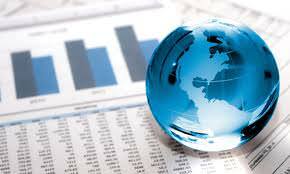 Full set of Client Application Documents with your License Countries "Secure Platform Funding Master Broker Logo"
Special Secret Priority Secure Platform Funding Support Email that immediately places any emails from Master Country Brokers to the top of the support queue, ensuring you receive premium support before other clients or brokers. The Master Country broker License automatically renews every year for the 4 years at no charge to the licensee provided the licensees country completes a minimum of 4 deals per year with Secure Platform Funding. Deals may originate from any broker. Click Here: Reserve Your Chosen Master Country Broker Licence Today! This is an example of a 3rd party broker transaction that is not connected or related in any way to the Master Country Broker and how much the Master Country Licensee would earn just by owning the Country License that the 3rd party broker transaction was completed in his territory. This is an example of transaction that is initiated and completed directly by Master Country Broker with the Master Country Broker also being registered as a Gold Broker. How to Purchase a Master Country Broker License? Click here and process the $499 USD payment to Immediately Reserve your selected Country. This stops any other person from being able to purchase your desired country for 10 days. Mark your Country as "Under Contract" in the Complete List of Master Country Broker Licenses (below). You email us back the signed and completed Master Country Broker License, we then counter sign the Master Country Broker License and email a copy to you. You complete payment for the full purchase price of the Master Country Broker License (less the $499 you already paid) within 48 Hours.